Tubular pasteurizers | Reda s.p.a.
REDA pasteurizers are fully automated systems in which the product is heated in an indirect way, therefore with no direct contact with the heating medium. Heating takes place in a “gentle way”, thus keeping intact quality of the product. They use heat exchangers with “multi-tube in tube” modules in AISI 316L type. They have a corrugated pipe design to give high thermal exchange efficiency and allow easy inspection in the product side. High heat regeneration is achieved with both product/product or with an auxiliary circuit of sterile water in recirculation and can reach up to 90%. 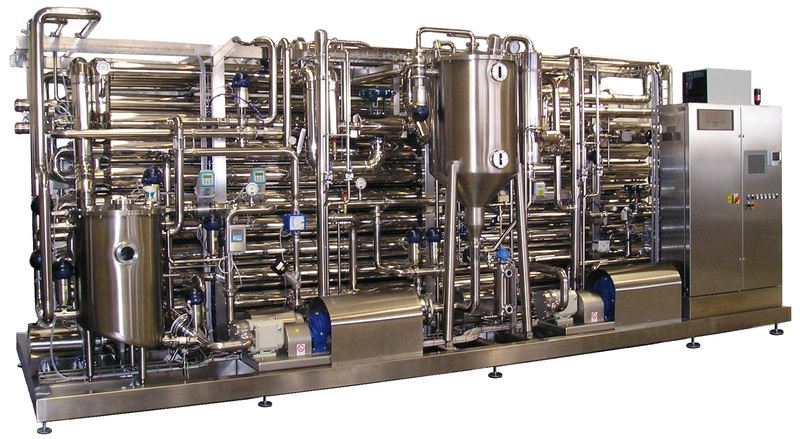 These systems are designed to meet all technological packaging requirements (cold filling, hot filling, aseptic filling) and can be combined to accessory systems such as deareators (with aroma recovery), homogenizers, aseptic tanks, integrated CIP. Automation of REDA plants provides for the programming of PLC, PC and supervision systems to allow control of the plant (also in remote) or the integration in more complex process systems. The units are pre-assembled on a stainless steel skid, conceived and realized for an easy installation on site thanks to the constructive philosophy “Plug-and-Play”. Production capacities can vary from a minimum of 1000 l / h to a maximum of 30,000 l/h, with fixed or variable speed.